The Sidebar: Who Saved Otto Klug? Investigating a 75-year-old Connecticut mystery -- my father's "first save" or his first media scam? 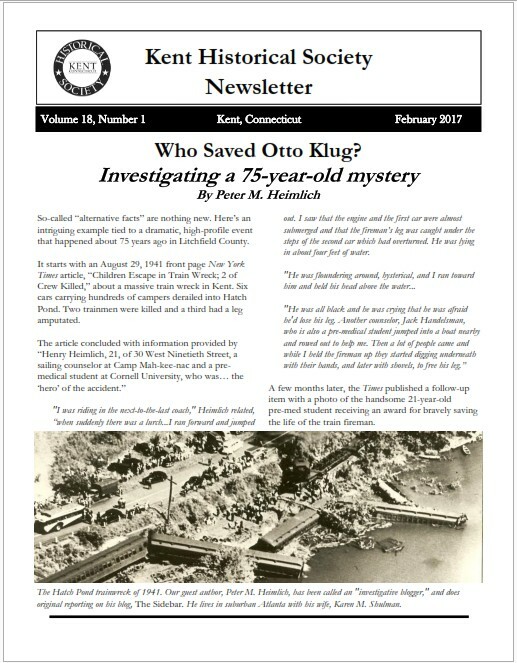 Who Saved Otto Klug? Investigating a 75-year-old Connecticut mystery -- my father's "first save" or his first media scam? I'm co-publishing this article with the February 2017 issue of Connecticut's Kent Historical Society Newsletter. I'm grateful to the organization and especially to Executive Director Brian Thomas who invited me to write the article and did a first-rate editing job. Click here for the hard copy version. So-called “alternative facts” are nothing new. Here’s an intriguing example tied to a dramatic, high-profile event that happened about 75 years ago in Litchfield County. 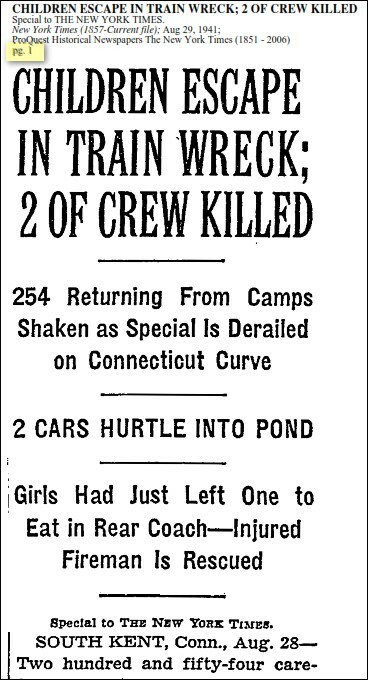 It starts with an August 29, 1941 front page New York Times article, “Children Escape in Train Wreck; 2 of Crew Killed,” about a massive train wreck in Kent. Six cars carrying hundreds of campers derailed into Hatch Pond. Two trainmen were killed and a third had a leg amputated. "I was riding in the next-to-the-last coach," Heimlich related, “when suddenly there was a lurch...I ran forward and jumped out. I saw that the engine and the first car were almost submerged and that the fireman’s leg was caught under the steps of the second car which had overturned. He was lying in about four feet of water. 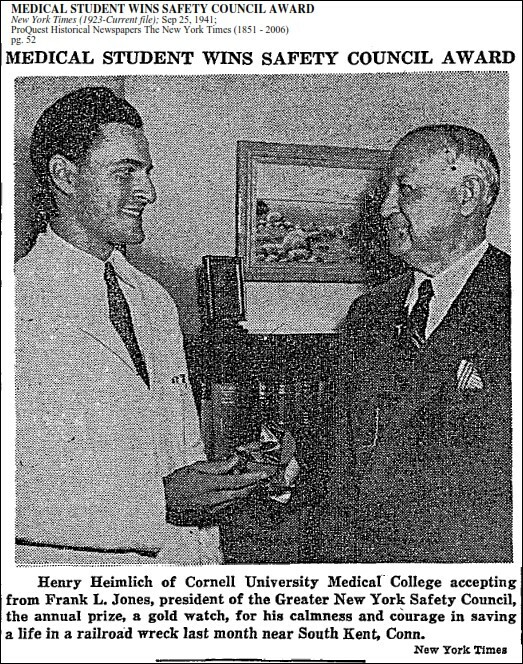 A few months later, the Times published a follow-up item with a photo of the handsome 21-year-old pre-med student receiving an award for bravely saving the life of the train fireman. The sailing counselor and apparent hero was my father, Henry J. Heimlich MD, who died a couple of months ago. If the name rings a bell, it’s probably because of a choking rescue treatment he first called “the Heimlich method” in the June 1974 medical journal Emergency Medicine. Only two years later, what had been renamed “the Heimlich maneuver” was incorporated into national first aid guidelines. Since then my family name became a household word and my father’s namesake treatment has been credited with saving the lives of thousands of choking victims. Fast forward to Spring 2002 when my wife Karen and I began researching my father’s career. To our astonishment, we uncovered an unseen history of fraud that revealed him to be a remarkable charlatan and serial liar. Most shocking, he’d used nonexistent or fraudulent data in order to promote a string of crackpot medical claims that resulted in serious injuries and deaths. My dad was no slouch when it came to singing his own praises to anyone in earshot and I was no exception. Most of our time together consisted of him telling me about his achievements and awards, especially after he became famous. And that was my first problem with the train wreck story – over the decades he never mentioned it to me. I only learned about it in the early months of our research when Karen and I happened upon the 1941 New York Times articles. My interest was piqued, so about 14 years ago, I decided to take a closer look. Via public libraries in Connecticut, I obtained copies of every article I could find about the headline-making disaster. I also contacted Marge Smith at the Kent Historical Society who sent me some paperwork from their files and put me in touch with Emily Krizan, whose husband, Joseph Krizan Jr., reportedly participated in rescue efforts at the train wreck, including helping the trapped fireman, whose name was Otto Klug. Interestingly, none of the articles and none of the people with whom I communicated said anything about any camp counselor (or my father by name) being involved in the rescue. Instead, they near-unanimously identified a local resident named Jack Bartovic as the person responsible for holding Klug’s head above water for hours. Local residents Charles Dutcher Edwards and Philip Camp were also identified as participants in the rescue. Joseph Krizan, Jr., had seen the locomotive and cars topple off the track into Hatch Pond at South Kent yesterday as he was mowing the grass in front of his mother's house, just off the South Kent Road. He and a friend, Jack Bartovic, ran toward the accident as fast as they could...Krizan was the first person to reach the scene. Bartovic didn't get into the car, because he saw a man half in and half out of the water, a short distance away at the other end of the car. It was the fireman, Otto Klug, of Seymour. Bartovic waded in and held Klug's head above water, for his leg was caught. Later they found it had been almost severed and a doctor wanted to cut it off and get Klug out of there, but Klug said, "My leg isn't bad. I won't let you cut if off. I'll wait until the crane gets here and they lift the car off me." So Bartovic stayed with him for more than two hours, and the crane lifted the car and then Klug saw that his leg was hanging only by flesh. Krizan and Bartovic told their stories as they watched the wrecking crew working on the derailed trains in the late afternoon sunlight that slated off the green quiet hills. 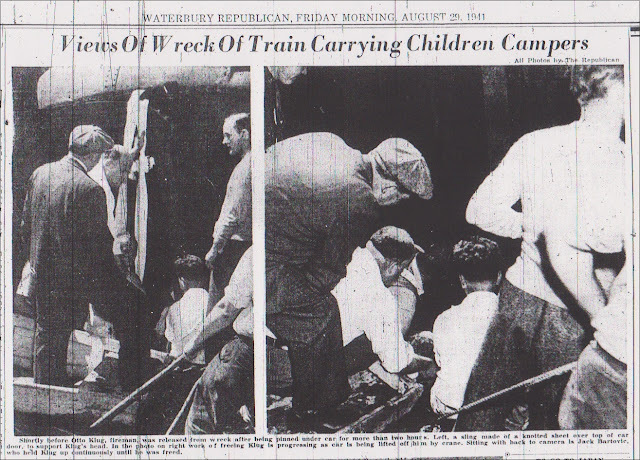 At the time I also interviewed Jacob “Jack” Handelsman – the camp counselor my father told the Times reporter had “rowed out to help me.” Dr. Handelsman, then a prominent surgeon at Johns Hopkins, vividly recalled how he and my father safely escorted the young campers off the train to the road adjacent to the tracks. However, he'd never heard anything about my father being involved in Klug's rescue and didn’t remember anything about a rowboat. When I asked him about the bravery award given to my father, he expressed surprise because they'd remained friends and my dad had never told him about it. Via my father's 2014 memoir, Heimlich's Maneuvers. Click here for a copy of the chapter. Do you have more documents and/or information to share? If so, please contact me and/or the Kent Historical Society.